Leather Jewelry–A New Lark Love Story! Home/Blogs/Leather Jewelry–A New Lark Love Story! I usually don’t review/share/blog about cool books herein, but now’s as good a time as any to start! You know how I love adding any new material or technique to my jewelry making arsenal? 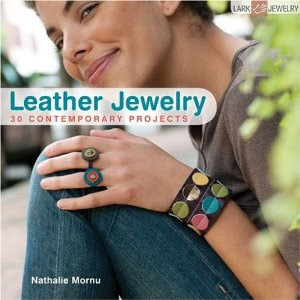 Well, I’ve got another arrow to drop in my quiver with Nathalie Mornu’s new Leather Jewelry: 30 Contemporary Projects! Fave projects include: Big Zip (Joan K. Morris) (what a surprise that I’d like a zipper necklace); Link (Marina Massone) (can you say way-cool interlocking-ness? ); and Gossip (Nathalie herself) (the dictionary defines this one as “pure flirt!”). The book’s subtitle marks the projects as contemporary, and it tells no lie! The designs are clean, colorful, fun, and fresh! My love fest finale is all about the book’s gallery. You see, when that green-with-envy feeling starts to well up inside, and I know “I wish I would have thought of that first,” it’s a good-sign-of-good-design! Suffice it to say, that I’m about as green as I can get about Leather Jewelry–and that’s a GREEN-LOVE-THING for sure! Moodling: Deep-Brain Cultivated Ideas at Work for YOU!